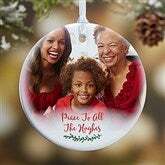 This holiday season, present friends and family with a keepsake ornament featuring a precious photo of the ones they hold dear with our exclusive Holly Branch Personalized Premium Family Photo Ornament. A picture-perfect way to decorate any Christmas tree with the faces of those they love. Include all the kids, grandkids and family members through the years!